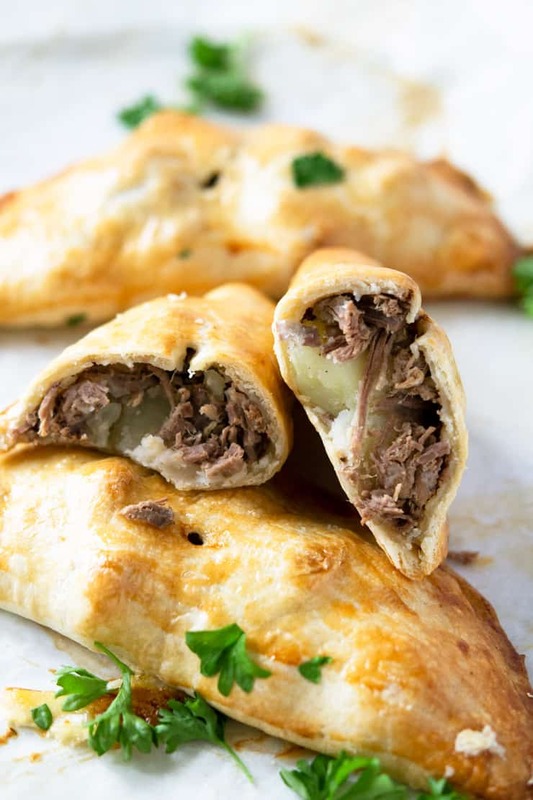 These easy beef and potato hand pies (aka: classic Cornish Pasties) are made with leftover roast beef and healthier store bought pie crust to save you time in the kitchen! Wholesome comfort food that’s sure to please! Before our trip to England a couple of years ago, my impression of British food was pretty dismal. Once we got there, I was pleasantly surprised by all the great food we ate in the restaurants, pubs, and tea rooms of England – the fish and chips, steak and ale pie, Scottish shortbread cookies, and Cornish pasties (just don’t think about the name) were all amazing! Meat pasties were the preferred “fast food” of the 19th century English working class. Meat and potatoes could be stuffed into pastry dough and baked for a grab and go lunch that laborers could take with them to work. 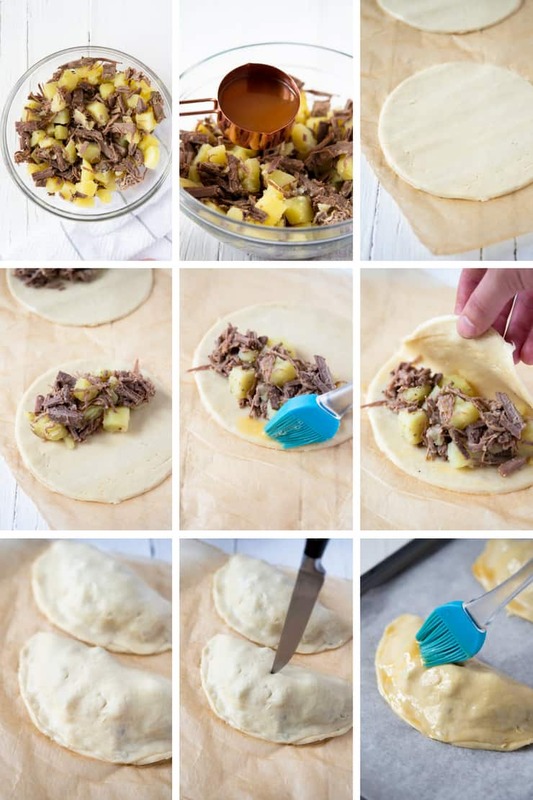 Imagine being sent to school or work with tender, juicy beef roast and potatoes stuffed inside a flaky pie crust. Homemade comfort food is way better for lunch than a turkey sandwich, if you ask me. Technically, you could spend loads of time rolling out homemade pie crusts and stuffing them with raw beef and vegetables to get the true Cornish Pasty experience…or you could save tons of time and use leftover meat and potatoes from this slow cooker beef roast and a frozen pie crust from Trader Joe’s for an equally amazing experience. Um, YES. Mix together the leftover roast beef and potatoes then pour over some leftover beef cooking juices. Roll out pie crusts and use a 8-9″ tart pan or other pan, inverted, to cut the dough into 4 large circles. You may have to reform and roll the dough between cuttings to get all four circles. Lay 2 dough circles on each parchment lined baking sheet. Pile about 1 1/2 cups of the meat and potato mixture (with juices) onto one half of each dough circle. Spread evenly over that half of the dough circle, leaving about 1/2″ rim around the edge for crimping. Sprinkle some sea salt and pepper over the meat and potato mixture. Use a pastry brush to brush the 1/2″ rim of pastry with some of the beaten egg – this will serve as “glue” to seal the pastry edges. 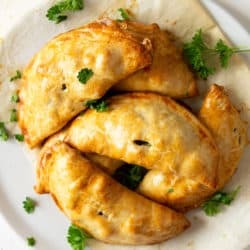 Gently fold the “blank” side of each dough circle over the meat and potato filling side, matching the edges of the pastry to create a half-circle shaped hand pie. Use your finger to press and seal the edges of the pastry together, fluting them for decoration if desired. Once each hand pie is formed, use a very sharp knife to lightly score the top of each pie. Use a pastry brush to cover the surface of each hand pie with beaten egg. Bake for 25-30 minutes or until crusts are golden and firm to the touch then serve! 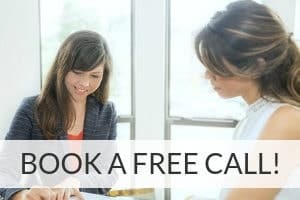 I used leftover beef from my slow cooker beef roast recipe but you could use any kind of leftover roast such as chicken or pork. 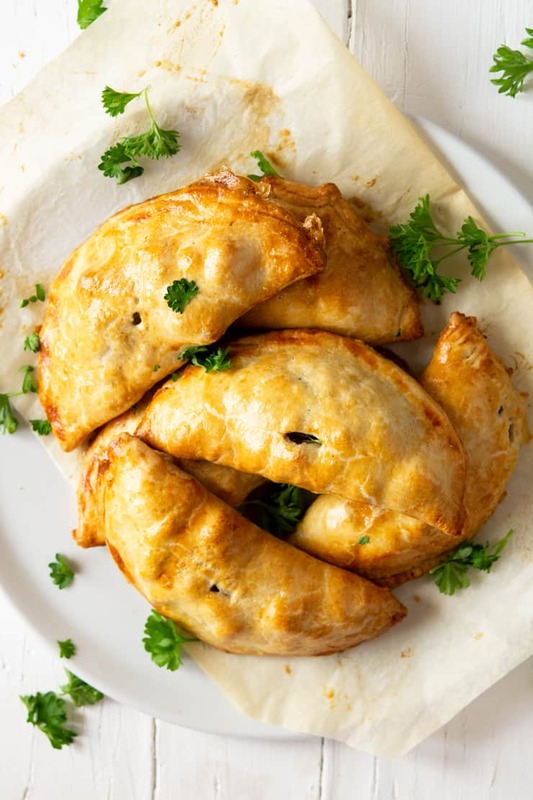 You can also stuff these hand pies with leftover veggies such as peas, carrots and onions. Try adding different herbs such as oregano or rosemary. When working with the pastry make sure to work fast and keep your work surface as cool as possible. If the pastry gets too warm the edges won’t close properly and the filling will ooze out. If your pastry gets too warm simply put it in the freezer or fridge or 5-10 minutes to cool down (make sure to cover it). Make sure your filling isn’t too wet or your pastry will get a soggy bottom and not be nice and crisp. I don’t usually recommend store bought pie crusts since most of them are made with hydrogenated oils and other preservatives, but the Trader Joe’s frozen pie crusts are made with a few simple ingredients – flour, butter, palm oil, water, and salt. Thank you, TJs! 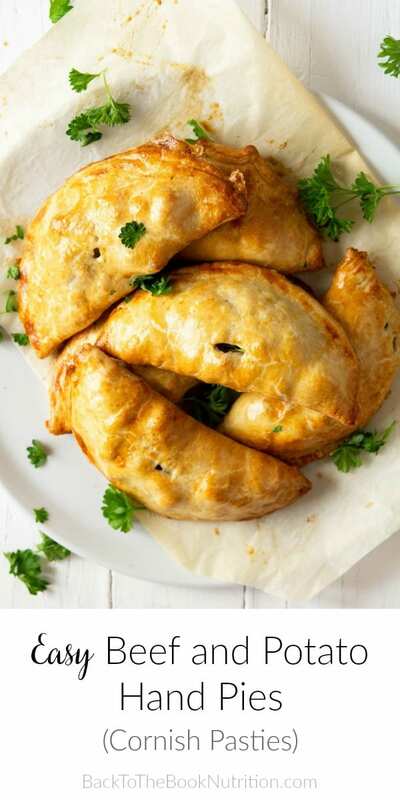 Simple beef and potato hand pies (aka: classic Cornish Pasties) made with leftover roast and healthier store bought pie crust! Dough for 2 pie crusts if you're short on time, Trader Joe's has a frozen pie crust made with clean ingredients! Preheat oven to 400 degrees and line two baking sheets with parchment. Roll out pie crusts and use a 8-9" tart pan or other pan, inverted, to cut the dough into 4 large circles. You may have to reform and roll the dough between cuttings to get all four circles. Lay 2 dough circles on each parchment lined baking sheet. Pile about 1 1/2 cups of the meat and potato mixture (with juices) onto one half of each dough circle. Spread evenly over that half of the dough circle, leaving about 1/2" rim around the edge for crimping. Sprinkle some sea salt and pepper over the meat and potato mixture. Use a pastry brush to brush the 1/2" rim of pastry with some of the beaten egg - this will serve as "glue" to seal the pastry edges. Gently fold the "blank" side of each dough circle over the meat and potato filling side, matching the edges of the pastry to create a half-circle shaped hand pie. Use your finger to press and seal the edges of the pastry together, fluting them for decoration if desired. Once each hand pie is formed, use a very sharp knife to lightly score the top of each pie. Use a pastry brush to cover the surface of each hand pie with beaten egg. Bake for 25-30 minutes or until crusts are golden and firm to the touch. Leftovers store well and can be reheated in a 325 degree oven (cover with foil to prevent over browning). When working with the pastry make sure to work fast and keep your work surface as cool as possible. If the pastry gets too warm the edges won't close properly and the filling will ooze out. Make sure your filling isn't too wet or your pastry will get a soggy bottom and not be nice and crisp. I don't usually recommend store bought pie crusts since most of them are made with hydrogenated oils and other preservatives but, if you don't have time to make your own, the Trader Joe's frozen pie crusts are made with a few simple ingredients - flour, butter, palm oil, water, and salt. Thank you, TJs! These look so fun to make! That pie crust looks perfect too! These look so delicious. I have never thought of making pasties myself! These sound delicious! I need to find a good gluten-free pie crust to try these out! I’m definitely saving this recipe to try making for my kids. They love anything they can pick up with their hands! Thanks, Vanessa. 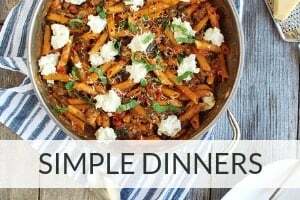 These were definitely a hit with my kids, and I really think you could put just about anything in them – leftover ground beef, chicken, etc. Enjoy! Mmmm Love Pasties ~ Thanks for the recipe. Sounds delicious! Wow these look fabulous! My husband would LOVE if I made these for him. These are complete comfort for me!! My favorite is savory pastry!